You can see that I watched this one all summer. He hung around in a 3 acre alfalfa field in an opening in the woods. I lost him for a week or so when it was getting close to archery season. One week before the season, I was was checking out some property across the road from where he was hanging out and he jumped up right in front of me. I set up in an oak grove just off of a CRP field. I sat here a few times a couple mornings and a couple nights, I saw nothing but does and a couple basket bucks. On the fifth day of the season, on a morning hunt, I was soon to leave my stand and he appeared out of nowhere out in the CRP field about 100 yards away. He headed straight for the oak grove to get himself some acorns. He was 1 step from my shooting lane and I was about to pull back when he stopped, did a complete 180 and slowly walked directly behind my tree. He got within yards but didn't give me a shot. At least I was on to him now. I sat in that stand a couple more times but never got sight of him again. One night my brother saw a big buck back in the original location where he spent all summer. He wasn't sure if it was the one or not but it was big. I went back there the next day and he was the last one out of the woods, but it was him. He followed the same path every night. I was in the only location I could be based on the wind. He would walk by at 55 yards, never farther, never closer. I just didn't want to take that shot. All the little bucks and does would come within 10 yards, but not him. 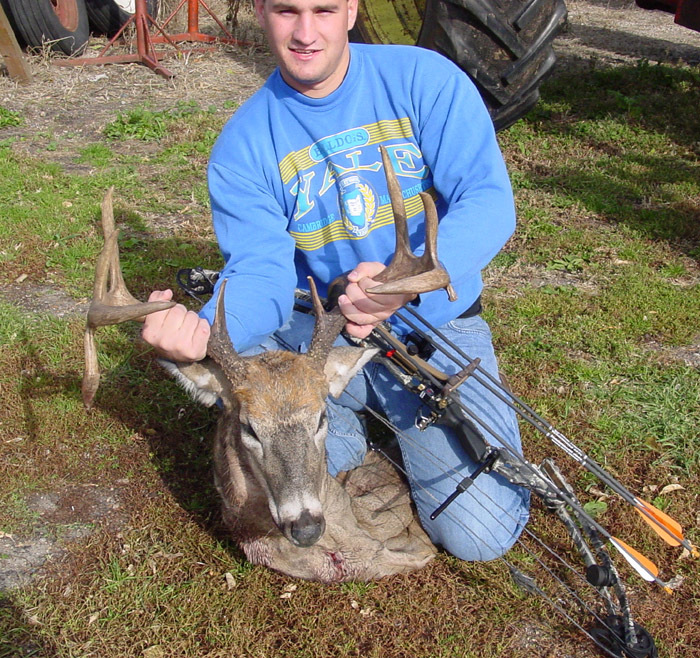 On several occasions I had a 115 inch 8 point, but I passed him up knowing the bigger one would come; he always did. I would make it out 2 or 3 times a week and this went on for about 3 weeks. 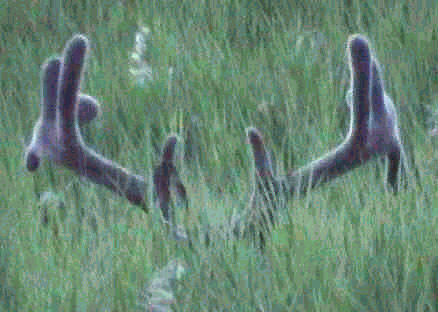 Finally, one night he came by at 34 yards, I shot, he ducked it and I missed. I thought that was the last of him. I gave it a 4 day break and went back out. I had a total of 9 bucks come by that night. The 115 inch 8 point came by at under 20 yards and I was going to take him as it was getting late and I didn't know if the big one would be back. Just then he came out, about 300 yards away just like every night. He worked his way over to me on the same path as before. Once again at 34 yards I shot, this time I hit him and he ran 50 yards and it was all over.